The Open Systems Interconnection reference model has been an essential element of computer network design since its ratification in 1984. The OSI is an abstract model of how network protocols and equipment should communicate and work together. The OSI model is a technology standard maintained by the International Organization for Standardization (ISO). Although many of today's technologies do not fully conform to the standard, it remains a useful introduction to the study of network architecture. 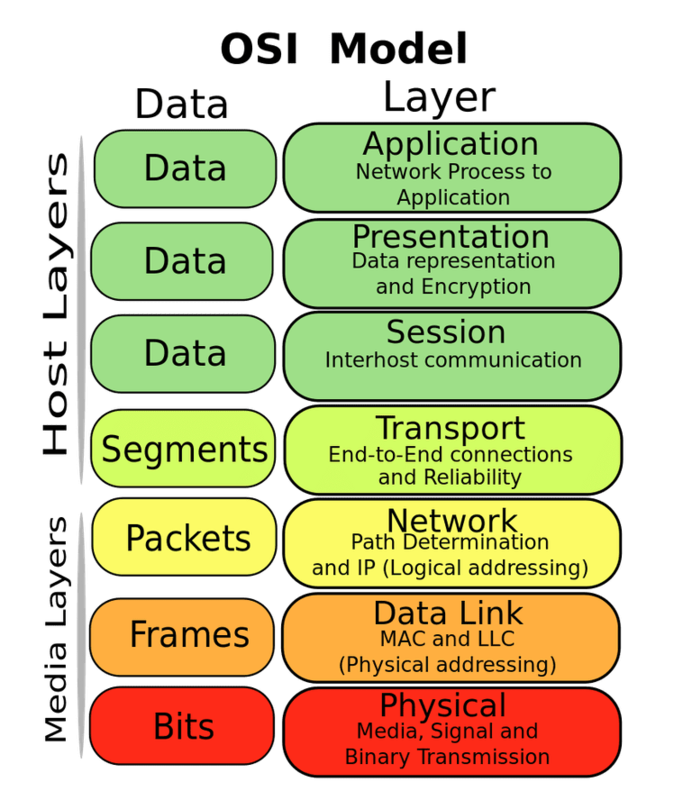 The OSI model divides the complex task of computer-to-computer communications, traditionally called internetworking, into a series of stages known as layers. OSI designates the Application, Presentation, and Session stages of the stack as the upper layers. Generally speaking, software in these layers perform application-specific functions like data formatting, encryption, and connection management. Examples of upper layer technologies in the OSI model are HTTP, SSL, SCP, NetBIOS, SMTP, FTP, RPC, DNS, and NFS. The remaining lower layers of the OSI model provide more primitive network-specific functions like routing, addressing, and flow control. Examples of lower layer technologies in the OSI model are TCP, UDP, IP, Ethernet, RDP, ICMP, IPsec, IPv4 and IPv6, RIP, token ring, Bluetooth, USB, DSL, and GSM. The seven layers of the OSI model work together, one by one, to complete a full task. All of this work, of course, happens behind the scenes, so even when you're using the concept of the OSI model, you might not even realize it. For example, when your computer requested this web page, the device may have used an Ethernet connection to relay the information through a router, and the request ultimately landed on an HTTP server where the page resides. In this example, the OSI model was used from the lower layers to the upper layers, from layer one through layer seven. By separating network communications into smaller logical pieces, the OSI model simplifies how network protocols are designed. The OSI model was designed to ensure different types of equipment (such as network adapters, hubs, and routers) would all be compatible even if built by different manufacturers. A product from one network equipment vendor that implements OSI Layer 2 functionality, for example, will be much more likely to interoperate with another vendor's OSI Layer 3 product because both vendors are following the same model. The OSI model also makes network designs more extensible because new protocols and other network services are generally easier to add to a layered architecture than to a monolithic one. See these common questions and answers about the OSI model for more information.